"I'm Julia Child. Bon appetit!" I was never a faithful viewer of Julia Child's cooking show when it was on, but it was hard not to recognize the face behind the extra cheery, sing-songy voice of the 6'2" American chef who burst onto the scene in the 1960s and introduced America to French cuisine. Now her story has come to the big screen. 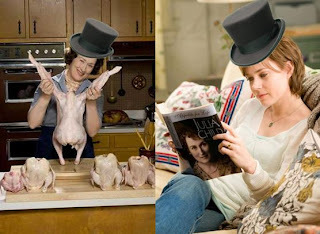 Julie & Julia, reteams the grand dame Meryl Streep and Amy Adams (also costars in Doubt), chronicles the icon's rise to fame from amateur cooking student to cooking teacher extraordinaire while also highlighting the touching relationship she had with her beloved husband Paul. The film cleverly parallels the present day story of how one of Child's proteges, Julie Powell, in an effort to regain purpose in her own life, makes it her mission to recapture each and every one of Child's delectable recipes from her bestselling book "Mastering the Art of French Cooking." The result? Julie & Julia--the touching true story of how one woman's passion for fine cuisine illuminated another woman's sense of fulfillment. This story itself kind of flatlined and wasn't suspenseful or shocking or even had a real climax. It would have been interesting to learn more about how Child's books and cooking influence international politics and McCarthyism, which was briefly touched on in the movie, but never fully explained. However, Streep's portrayal of Child was dead-on--the gestures, the voice, everything. She truly channeled Child. And Adams was also endearing as the desperate housewife on the brink of finding herself. Overall, a delicious film.